Happy Snack is the new stylish Highchair from Chicco. Practical and light, it's also comfortable and functional with a backrest that can be reclined to three positions and a deep padded seat. It has a 5-point safety harness and a 4-position removable tray. When closed, it occupies very little space and weighs only 5.9 kg. It is ideal for car transport. Whats the basket at the bottom for? to catch all the food? Great price. And really annoying! 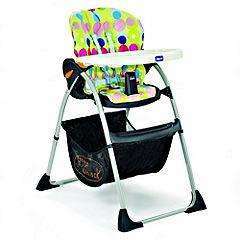 I spent £40 yesterday on a highchair similar to this for the grandparents house. Grrr!